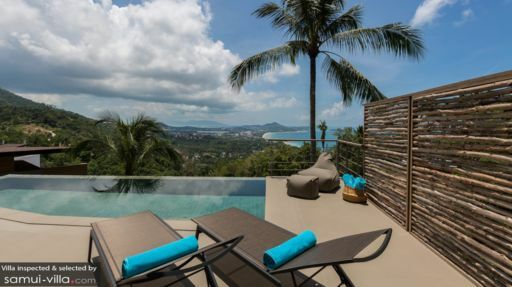 Villa Nuea is part of Comoon villa complex in Samui, Thailand, with two bedrooms that sport floor-to-ceiling glass walls offering ocean views. The complex is home to five villas and a penthouse, that have been furnished with a modern style, featuring contemporary décor and sophisticated living. 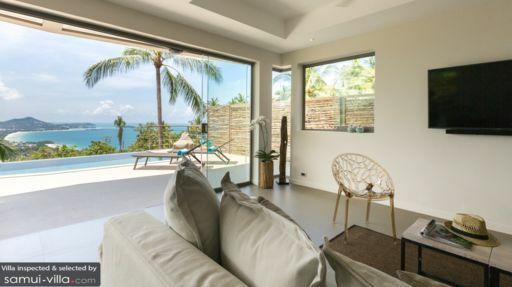 Villa Nuea is ideal for four people, be it couples, friends, or small families! The location is even more exciting as it is found close to Chaweng beach, which is known for its bustling nightlife and night markets where you can find local food and even shopping! The two bedrooms at Villa Nuea are nothing short of stunning as they are both master suites with floor-to-ceiling glass walls that look out towards the turquoise ocean with its sparkling water. The bedrooms are furnished with king-sized beds, a work space, air-conditioners, and televisions for your enjoyment. They are connected to a private terrace which has been furnished with sun loungers, the perfect spot for an afternoon nap! En-suite bathrooms are well-equipped with excellent amenities and facilities for your use. The pool area at Villa Nuea is great for relaxing as it not only gives you full access to the private swimming pool, but also provides a splendid view of the ocean that lies ahead. There are deck chairs beside the swimming pool, so you can lounge and chill with the cool breeze around you, and the refreshing ambiance rejuvenating your senses. There is an outdoor seating area as well for guests where they can enjoy a nice, hot breakfast, or a cup of tea while gazing at the beautiful sun-streaked sky! Villa Nuea is home to a splendid living area that is open-plan, meaning it features massive glass walls and doors that lead directly to the pool deck. The walls also allow you to enjoy an unobstructed view of the ocean right from where you are, without have to move outdoors. Furnished with comfortable and plush sofas that sit facing a Smart HD TV with DVD player, the living area is a pleasant place where guests can gather for a nice meal or some drinks. Part of the living area is the dining area as well as the kitchen at the villa, which is open for you to use as much as you wish. The dining table is a four-seater table with chairs that are conveniently placed so you can even view the panoramic vista. The kitchen is fully-equipped but you can even request for a personal chef to cook delightful Thai delicacies for you! 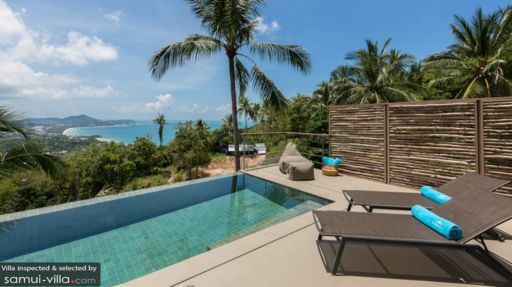 The villa is part of Comoon that is a luxury villa complex thus, offering guests various five-star amenities including a fitness centre, a highly-skilled staff overseen by a villa manager, as well as a personal chef. There are ample things you can do around the villa including yoga and massages that can be arranged upon request. The staff can even arrange for a Muay Thai training class exclusively for guests. Chaweng beach is close to Villa Nuea so guests have the advantage of having a famous tourist spot right at their doorstep. With numerous activities that you can engage in around the villa, you will never be bored. Head to the beach to indulge in snorkelling, scuba diving, jet skiing, and sailing!